Update: Dr. Camacho recently received a Presidential Award for Excellence in Science, Mathematics and Engineering Mentoring (PAESMEM) for 2018. 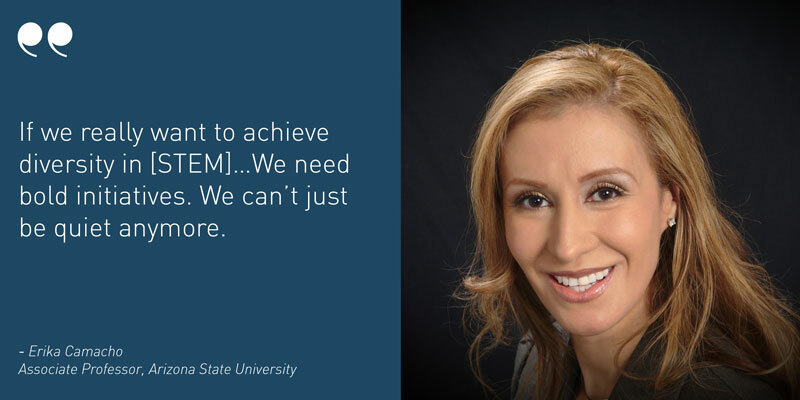 The SSMN staff sat down with Erika Camacho, associate professor at Arizona State University, to talk about her roles as a mentor, academic, and scientist. We discussed Dr. Camacho’s journey through academia, the responsibility she feels to be a mentor, and the difficulties of balancing service and research responsibilities. In her research, she published the first set of mechanistic models addressing photoreceptor degeneration laying the mathematical framework to study degenerative disease of the retina. While experimental physiologists have been working on this area for decades, Dr. Camacho has helped provide a new framework through which experimentalists can examine this degeneration. Her work examines the characteristics and interactions of photoreceptors that are critical to their functionality and viability, traces the path of various subtypes of Retinitis Pigmentosa, and tests/discriminates various hypotheses on certain degenerative eye diseases. The recipient of countless awards for her efforts in mentoring diverse undergraduates and graduate students in STEM, Associate Professor Erika Camacho obviously understands the impact she has had on students and the reverberations of her efforts as they move through graduate school: “if you honestly look at what I’ve done, it’s been great—the impact that I have had has been massive.” We met following a luncheon at the annual conference for the Society for the Advancement of Chicanos and Native Americans in Science (SACNAS) in Long Beach, California, which Dr. Camacho was attending as a board member, to discuss her career and her experience as a Latina in mathematics. Dr. Camacho spoke of the gratitude she often hears directly from students and the comments she receives second hand from faculty that have encountered students she has mentored since she began teaching. And that is why, despite being told by many peers and more advanced professors that she needs to minimize the amount of time she spends mentoring students so that she can advance her research, she exclaims, “Well, who will do it? Who will do it?” The sense of responsibility and urgency Dr. Camacho feels towards increasing diversity in STEM is rooted in her own experience in academia. After growing up in the public school system in East Los Angeles, she says she wanted her college experience to be completely different. Dr. Camacho applied to Wellesley College, a liberal arts college in Massachusetts, was accepted, and arrived to find that Wellesley operated within a world that she “did not realize…existed.” Citing not only her ethnicity as something that marked her as an outsider, Dr. Camacho notes that her socioeconomic status as someone who had been working for $10 a day since she was 11 years old and her public school education further alienated her from most of the student body. Though she credits Wellesley as an important influence on her ability to be assertive and confident, she also painfully recounted an experience she had in a physics class when her lab partner refused to work with her after finding out that she was of Mexican descent, saying: “I cannot afford for my grade to go down. And people like you bring the grades down, they don’t really have the knowledge.” After trying to complete both portions of the experiments by herself—acting as timekeeper and running the experiment—and failing, she turned to the professor in hopes that he would reassign her another partner. She explained that her lab partner would not work with her because she was Mexican and remembers her professor stating, “Well, I don’t blame her. I don’t know why we keep accepting people like you. I don’t know why we have to fill a quota and keep bringing people like you that are just going to fail out…so I don’t blame her.” Painful moments like these—recounted with tears in her eyes—are undoubtedly the points of commonality that drive her to continue to mentor despite the demands on her time. It is not difficult to see the vestiges of the scars which Dr. Camacho later describes—those that continue to inspire her efforts to increase diversity in STEM and those that she feels conversely constrict her ability to advance into leadership positions. And, while she speaks of the impact she has had on diversity within her discipline—the quote that opened this profile for example—Dr. Camacho did so within the context of trying to parse out how little this impact has mattered when it comes to receiving funding for her own research: “I believe that whenever you have individuals who come…and serve as review panelists, you have professors who come from MIT or places like that, who have never understood what diversity is about, how one actually creates diversity, and the investment that it takes—the time and investment is phenomenal, monumental.” It is this persistent issue—how success is measured in academia—that Dr. Camacho feels unfairly creates a binary between being an educator-mentor and being a scientist. Despite noting that she has been very successful in winning grants for students’ mentorship, professional development, and conference support, she points to her lack of success with research grants in the next breath. Is it possible to be deeply invested in creating diversity in STEM and be a serious researcher at the same time? Over the course of our conversation, Dr. Camacho described instances in which her status as a woman of color heightened others’ expectations of her service and, at the same time, limited her research opportunities. She detailed a tense interaction with a former mentor, also from an underrepresented group in the sciences, who said that “if I wanted to be a true mentor, I have to put myself last and my interests last.” This comment came after she stepped down from a service position within a mentoring program for which she wrote the programmatic grants but was never offered the principal investigator (PI) designation. One year, she declined to write the grant, thanked the PI for the opportunity, and then faced a fierce backlash and a barrage of emails about the extent of the PI’s own responsibilities. Implicit in this exchange was the expectation that his research responsibilities trumped hers and that the bulk of service for this program should be her responsibility. The gendering of service, and in particular, mentoring, was clear to Camacho in this moment and others. She points to this professional relationship as a learning experience. It has made her aware of the myriad ways that women are expected to be complicit in the “old boys’ network” method of doing things in her field. Dr. Camacho has taken the lessons from this troubled relationship with her former mentor and has sought to be a responsible and dependable mentor herself. And, while she says she will mentor anyone, she does qualify that: “I am biased with my time and put a little more dedication and more effort [in mentoring] women—women of color and underrepresented women…the ones that don’t have the role models. The ones that don’t have the mentors that will fight for them.” She does so because she knows “that many of them have to go through a lot to even get to the next step.” Undoubtedly, Camacho hears echoes of her own story in these students, and she has made a commitment to these underrepresented women in particular. 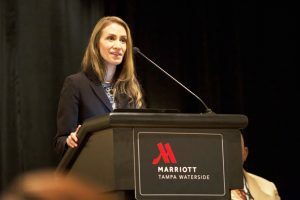 Dr. Erika Camacho has received national recognition for her leadership, scholarship, and mentoring, including the SACNAS Distinguished Undergraduate Mentoring Award in 2012, the National Hispanic Women Corporation (HWC) Latina Leadership Award in 2011, and the 40 Hispanic Leaders Under 40 Award in 2012. She was also named one of 12 Emerging Scholars of 2010 recognized by Diverse: Issues in Higher Education, and she received a citation for mentoring and guiding undergraduates in research by the US National Security Agency. She is currently an associate professor in the School of Mathematical and Natural Sciences at Arizona State University, which has also recognized her for her mentoring and service. She received her PhD in applied mathematics from Cornell University and was a 2013­–2014 MLK Visiting Assistant Professor of Mathematics at the Massachusetts Institute of Technology (MIT).